Valves are elliptic-lanceolate to broadly lanceolate, with obtusely rounded apices. The raphe is weakly lateral. Proximal raphe ends are deflected to the secondary side. Distal raphe fissures are hooked to the secondary side. The axial area is very narrow. The central area is moderately large, rounded and asymmetric. Striae are radiate, becoming convergent at the apices. Areolae are coarse, easily distinguished in LM and number 24 in 10 μm. 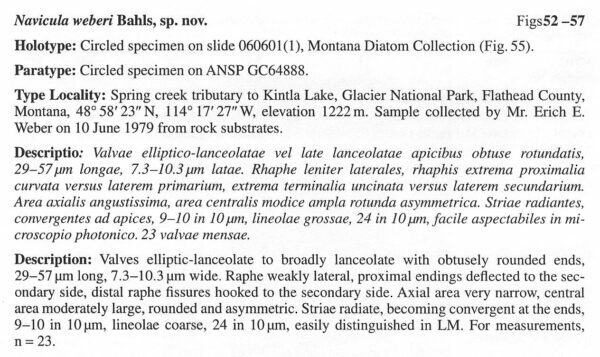 Navicula weberi has been collected from 20 lakes and streams in the Northern Rocky Mountains of western Montana, where it is present in low numbers. Here it prefers alkaline waters (pH range = 7.4-9.1) with low to moderate levels of electrolytes (specific conductance range = 49-256 μS/cm). 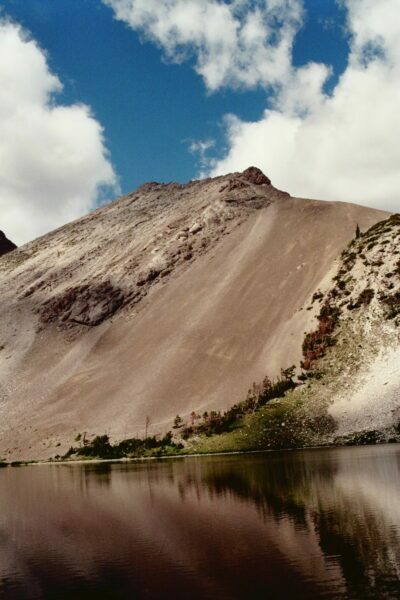 Our Lake in the Bob Marshall Wilderness near Choteau, Montana. Our Lake is home to Navicula weberi. Valves elliptic-lanceolate to broadly lanceolate with obtusely rounded ends, 29 – 57 μm long, 7.3 –10.3 μm wide. Raphe weakly lateral, proximal endings deflected to the secondary side, distal raphe fissures hooked to the secondary side. Axial area very narrow, central area moderately large, rounded and asymmetric. 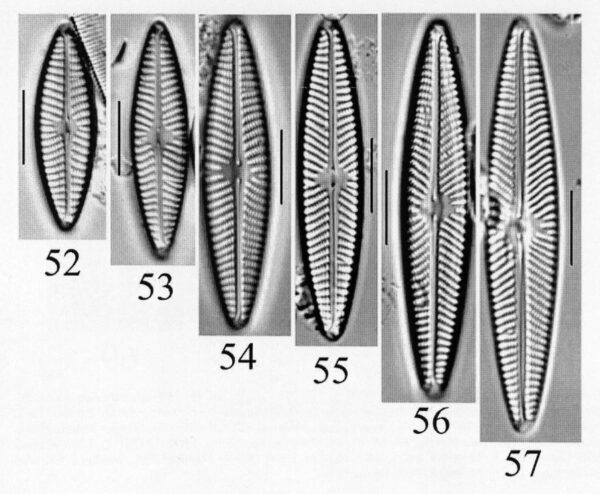 Striae radiate, becoming convergent at the ends, 9 –10 in 10 μm, lineolae coarse, 24 in 10 μm, easily distinguished in LM. For measurements, n = 23. 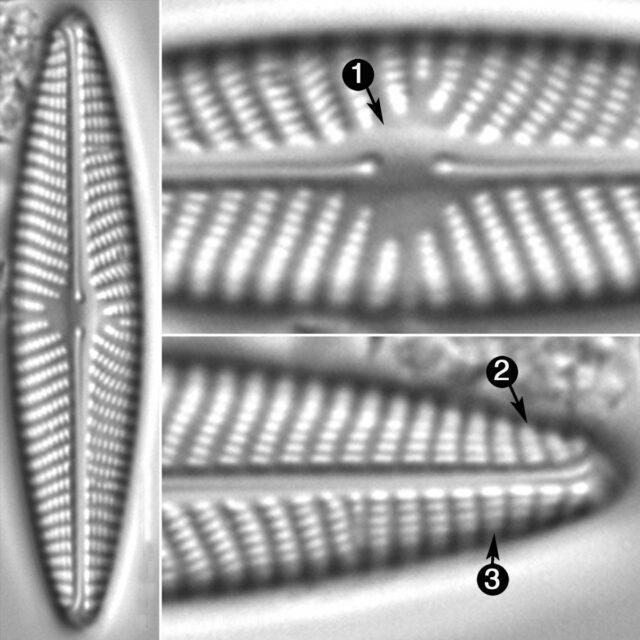 Navicula weberi has elliptic-lanceolate to broadly lanceolate valves with obtusely rounded apices. The central area is rounded and asymmetric. Striae are radiate, convergent at the apices and number 9-10 in 10 μm. Areolae are coarse and number 24 in 10 μm.